Under the domes, it’s almost possible to forget that Mars was never meant to sustain human life. For some Clan members, enduring the Martian Colonial Authority has felt like a small price to pay for the luxuries that are imported each day into Bradbury’s starports and distributed by mag-lev to the outlying nodes. But everyday it’s becoming clearer and clearer that the O2 recyclers, the multi-tiered aglots, and nextgen plasteel plates aren’t arriving for the benefit of the Martians who struggled and died for generations to build a civilization out of red, irradiated dirt. Instead, newly arrived corporate execs keep the best supplies for themselves and let the Martians squabble over their scraps. In Free Mars, the fifth data pack of the Red Sand cycle for Android: Netrunner, the Free Mars Council is encouraging their fellow Martians to see these aliens for who they are—schemers who see a stint on Mars as the best way to climb a ladder that’s grown too crowded on Earth. But a smear campaign against the Earthers may not be enough when the corporations control everyone’s access to the news, the water supply, and even the air they breathe. 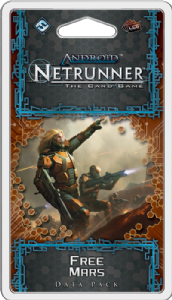 And new Corp cards illustrate how much control they can wield over the Runner’s choices when resources are scarce.